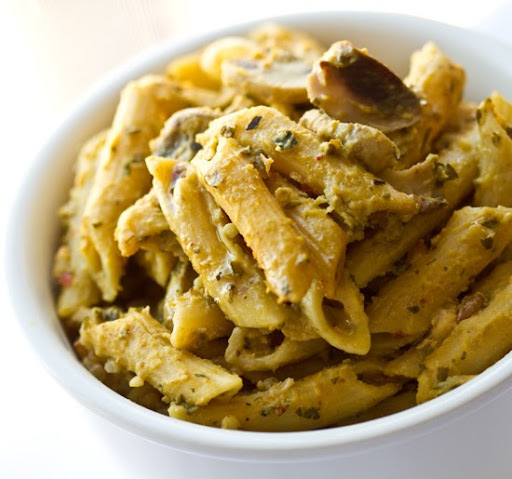 Acorn Afredo Penne Pasta. Vegan. I round my way to the seasonal 'squash section' of one of the Farmer's Market stands. 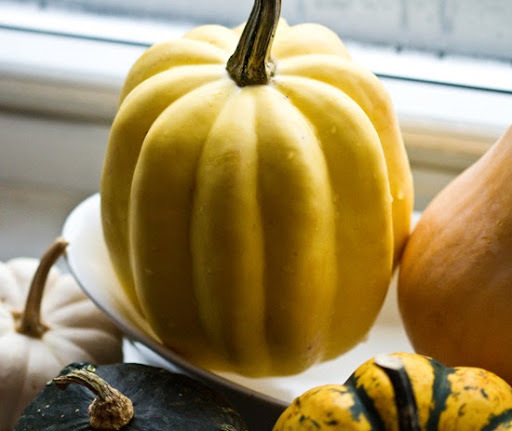 All those colorful, beautiful, decorative gourd's and plump squash varieties. I must have one. A pumpkin? Too big. A butternut squash? Love those, but they were all huge and J-shaped so.. Too awkward. Acorn Squash? Just right! Oh and the fact that Windfall Farms had a big bowl of them for $1 per squash was a pretty nice factor too. 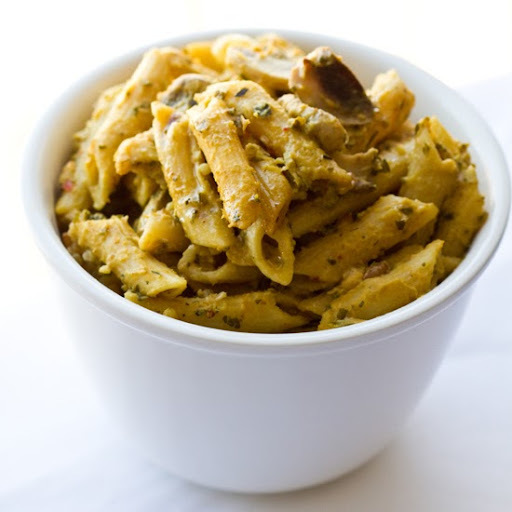 Delicious Accident: Acorn Alfredo! I had originally intended this recipe to be an Acorn Mac 'n Cheeze. 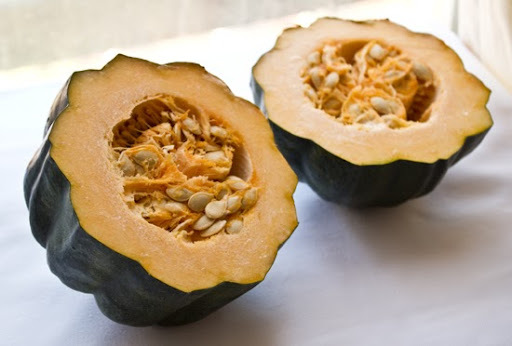 I wanted to basically substitute the normal sweet potato I use in my Mac 'n Cheeze recipe with my roasted Acorn Squash. 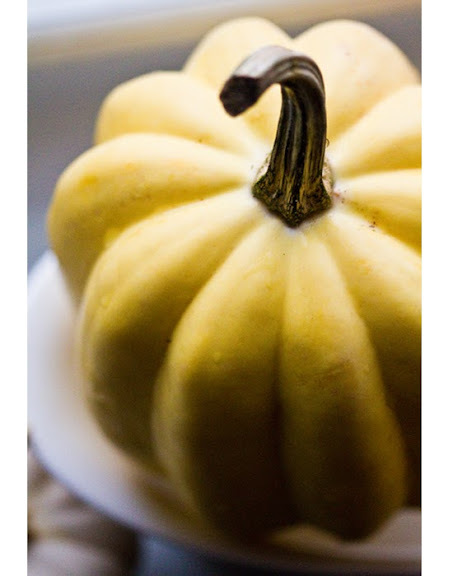 But as I started blending the ingredients I realized that Acorn Squash has an incredibly silky, velvet texture when pureed. The end result was a creamy sauce that more resembled a decadent, yet fluffy, Alfredo Sauce (as opposed to Cheezy Pasta). Roasted garlic, mushrooms, savory nutritional yeast accents, sweet squash and a hint of bright parsley and zesty Dijon mustard. Creamy, dreamy, dinner-approved. The leftovers were even better than the day-of pasta! 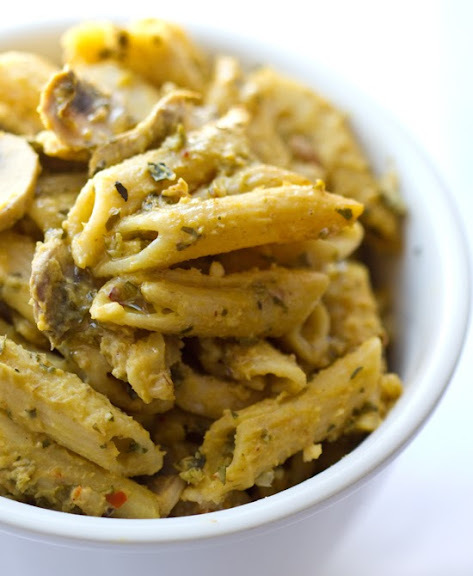 Because the sauce penetrated the penne pasta and each bite became extra flavorful. My Fave Squash? I love them all! Acorn is awesome. Butternut is bliss... I love to hack open a giant oblong butternut squash and roast it to maple-cinnamon perfection. 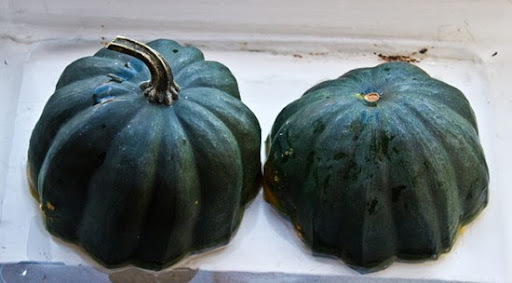 But on this day I chose Acorn for it's modest size - since I had two bags filled to the brim of Farmer's market goodies - and all I could manage was that sweet little (in squash terms) Acorn Squash. 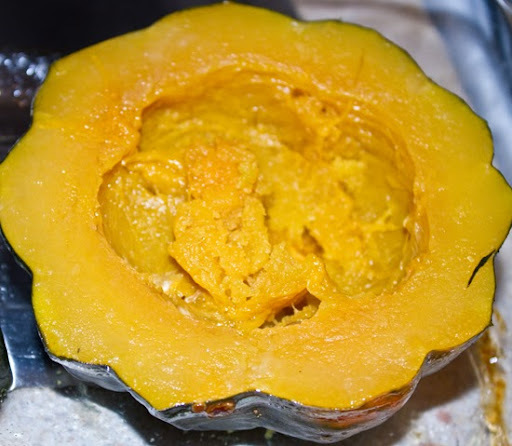 Nutrition: Healthy Acorn Squash. 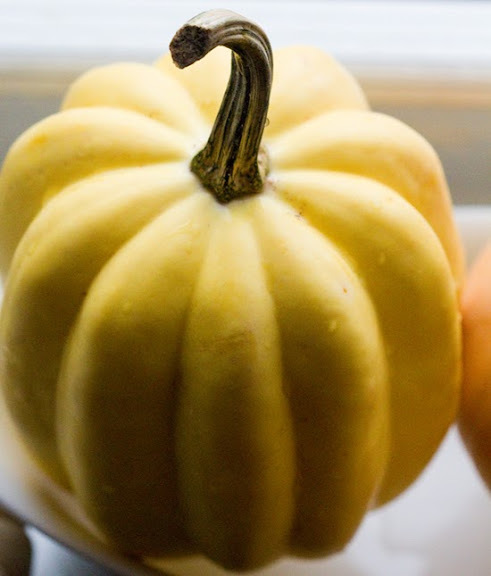 Acorn squash are rich in vitamin A, fiber, potassium - and they are a good source of vitamins C and B6. 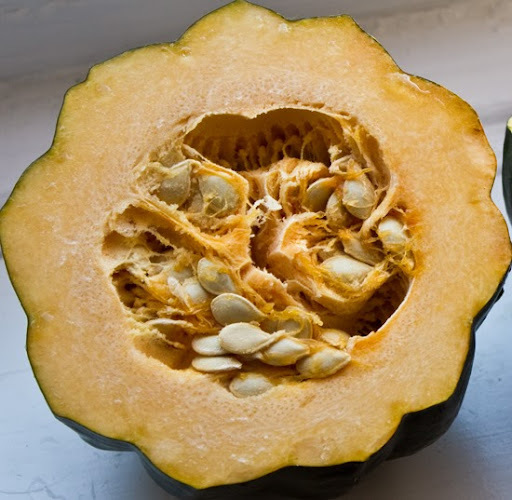 Medium squash has about 172 calories, 0 grams of fat, 45 grams carbohydrate and 3 grams protein. "The grain itself is very high in its protein content. It also contains a high mineral concentration especially in selenium, zinc, and magnesium. This grain variety is considered a high energy wheat, and provides the body with more energy in the form of complex carbohydrates. Because of its low oxidation levels it loses little nutritional content when being ground and processed. Even though this wheat variety contains gluten, it has been found to be more easily digestible by people who may have slight allergic tendencies." - Wikipedia - More on Kamut. White Squash! 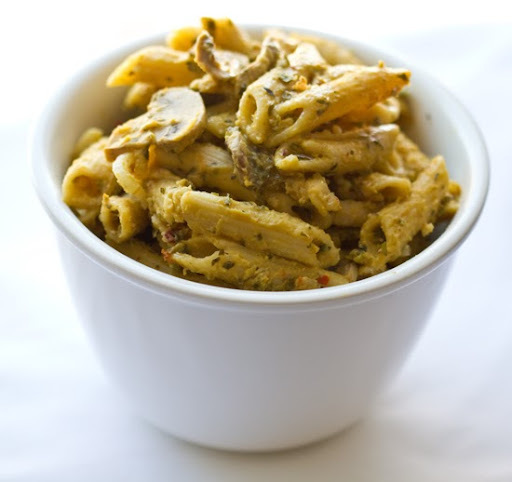 I didn't use white acorn squash in the pasta photos shown - but next time I will! 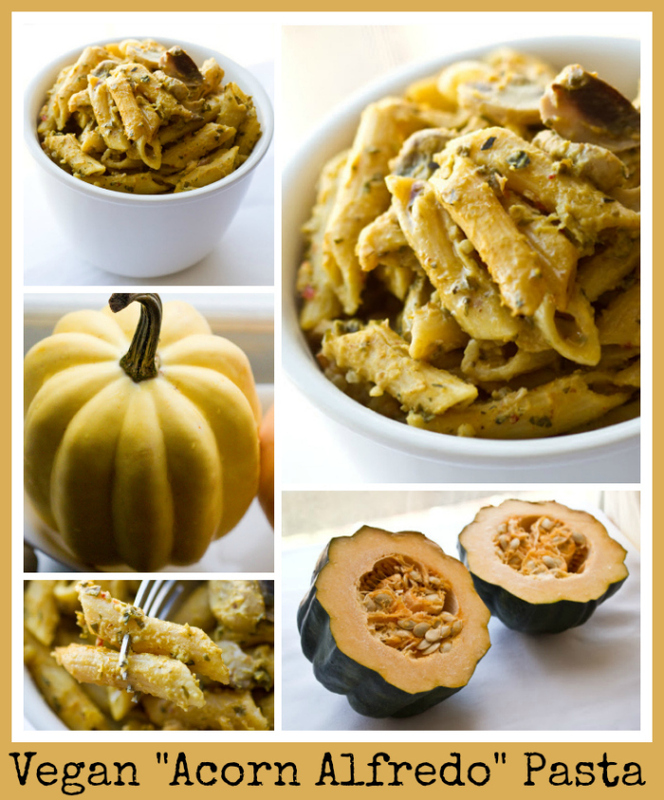 White Acorn Squash will create an even more authentic "Alfredo-esque" Pasta..
Full Meal Ready. I added a block of tempeh and one vegan sausage tube to my pasta because I wanted some added protein. You can omit these extras, or add them as the recipe calls. 2. Fill a casserole dish with an inch of water. 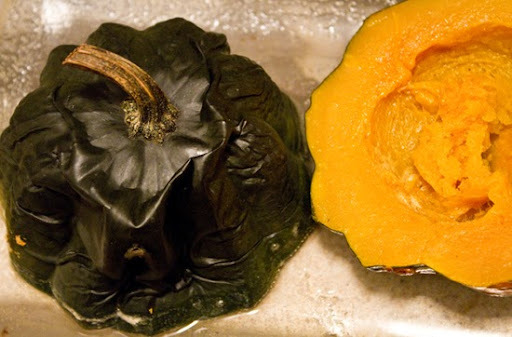 Slice Acorn Squash in half (horizontal slice as shown) and lay flat in dish. Place in oven to roast at 350 degrees for 60-75 minutes. 3. When your squash is roasted the skin should peel away quite easily. 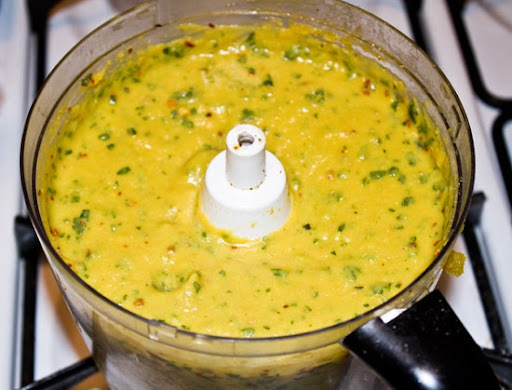 Remove all skin and place squash flesh in a food processor. Add all other ingredients. 4. Blend on high for at least 2 minutes. You want all the parsley to chop into fine bits. Set sauce aside. 5. Boil a pot of salted water. Cook your pasta. 2-3 minutes before the pasta is ready to drain, add mushrooms and optional protein add-in's. Drain as usual. 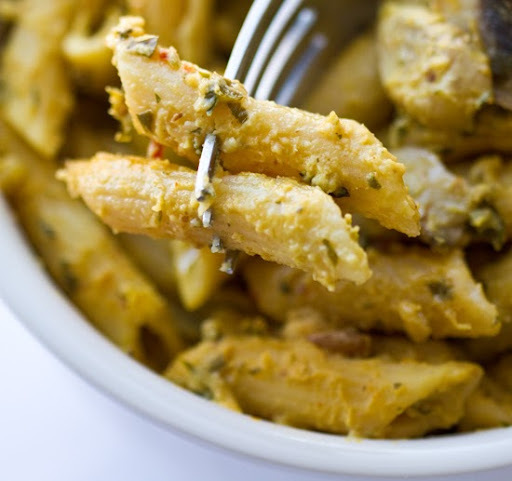 Toss dry pasta in a splash of EVOO (opt'l). QuickStep Note: I cook my mushrooms/tempeh and sausage simply by throwing them into my pasta pot 2-3 minutes before draining my pasta. This allows me to boil my protein/veggies quickly without adding in another step. I drain pasta/veggies/protein together. 6. 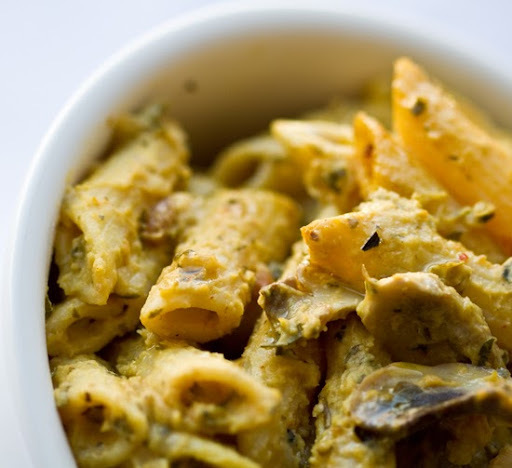 Toss warm pasta in your Acorn Alfredo Sauce. Mix well so each pasta bit is coated. 7. You can either store in fridge and re-heat later - or eat right away - or transfer pasta into an oven safe dish and let heat at 300 degrees for 20 minutes. This will marinate the pasta a bit and soften the sauce. You can even add a sprinkle of Daiya cheese on top if you'd like. Enjoy! This one is yummy for leftovers..!